We had an old-fashioned, rip-roarin’ thunderstorm claw its way through Yeosu earlier today, a nice respite from the bland, misty weather of late. It brought some brief, but heavy rain and cooled things down a bit, though it did nothing to relieve the miserable, high humidity. This is probably the worst time of year to be in Yeosu, July and most of August. 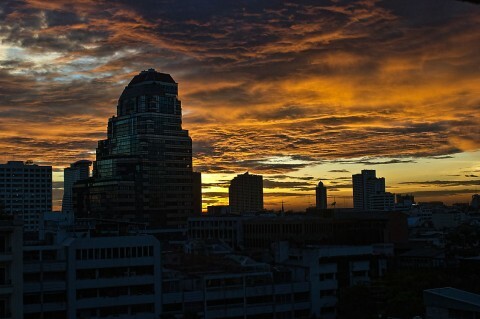 The storm brought back memories of Bangkok and some of the heavy rains that occasionally hit the city. In my previous post, Nai and I left Nongkhai, headed for the City of Angels. 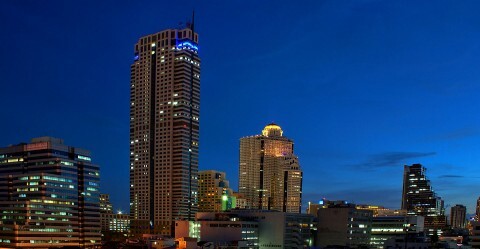 We checked into the same hotel, Silom City, that I had stayed at during the first part of my vacation. I had booked a room for 3 nights, unsure if we wanted to stay in the same area for the remainder of our time in Bangkok. The room we had was similar to the one I had earlier, with the same view out the window. We decided not to change hotels, so I asked the front desk if we could book the room for another 4 nights. They said the basic rooms were full, but they could move us into a deluxe room for about the same price, if I’d want to forego breakfast. Sure, I thought, why not. Well, the 8th-floor view from the new room was incredible. We had a small balcony with a floor-to-ceiling view of the Silom area skyline, one of the best views of Bangkok I’ve ever had. 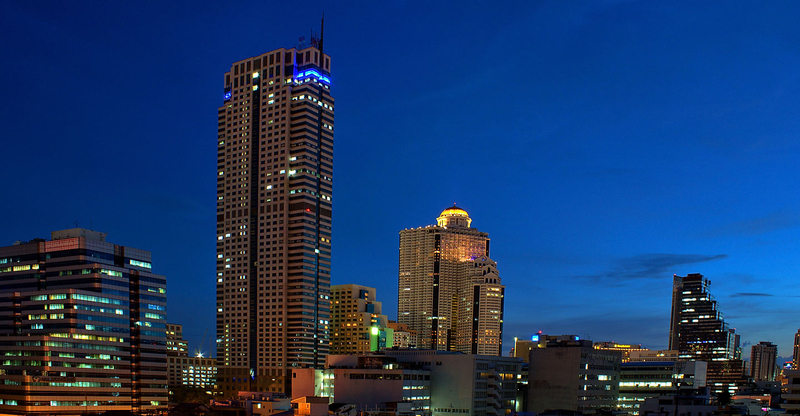 I stayed at the Baiyoke Sky Hotel way back in 2004, in a room on the 65th floor or so. That, of course, had a fantastic view, but this one ran a close second. Here are a few shots. 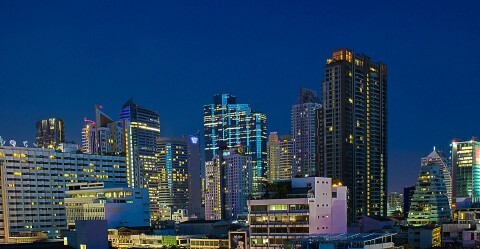 Several of the tallest skyscrapers in Bangkok are in this area. Here are a couple of (not very successful) panoramic shots. 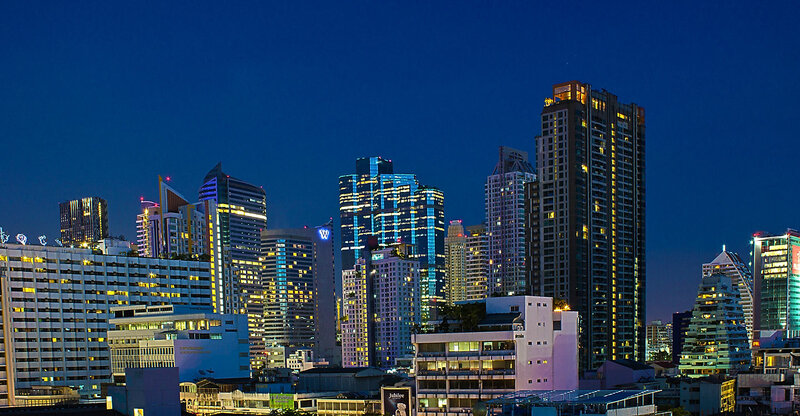 Anyway, I certainly recommend the Silom City Hotel, especially if you can get a deluxe corner room. That about wraps up my posts from my recent vacation. Stay tuned for some other stuff later, though I’m not sure what!